Should I practice for speed? To Shred, or not to shred? In this post we discuss some very common questions, and address a few misconceptions, concerning guitar speed and technique. I have had my students ask me these kinds of questions many times. Usually the logic behind such questions is that they feel that they have reached a level of technical ability that is more than adequate for the style of music they want to play. At the same time, in many guitar players’ minds, speed is associated only with certain specific music styles, where speed is featured as central. Although there is certainly some truth in these assumptions, I want to point out a concept that will help you make the right decisions in order to develop the effective practice strategy that is right for you. You see, there are no hard and fast rules that apply to everyone in exactly the same way. You need to have as much information as possible, in order to decide what’s best. Let’s say you are playing a song that requires playing sixteenth notes at 140 bpm. Your maximum speed is 150 so you are pretty comfortable, right? Well... that’s actually wrong! If your maximum speed is 150 then that means you are putting in a lot of effort and concentration to play 140, and that doesn’t leave much room for creativity, expression and imagination. If your maximum speed was much higher, it would allow you to sound better, even if you didn’t use all that speed in the song. In fact, if you study players that are very expressive and that you wouldn’t normally associate with fast playing, you will always find instances that actually show that they do have some speed, but choose not to use it because it doesn’t fit their style. Look at it this way: Imagine a simple children’s song played by a beginner and then played by an advanced player. Do you think they would sound the same? Even if both play the notes “perfectly”, the more mature player for some reason always sounds better. That’s because superior skills do come through in everything. Speed, accuracy, good technique in general is one of these skills. So it doesn't matter if you want to be a superfast shredder or if you want to play simple songs. Speed can help you sound better. So keep this in mind and be honest with yourself. Are you fast enough to be comfortable and free, or is your technique limiting your creativity? 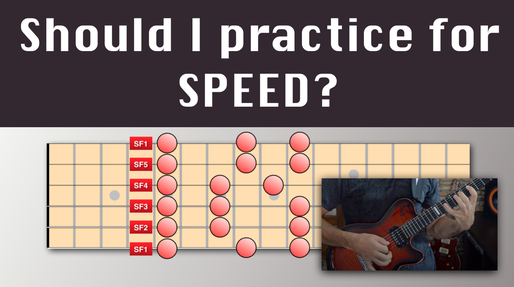 Is it necessary to practice for speed, or can you just maintain your level by playing and practicing other things? Well, if you are fully satisfied with your speed and you need to work on other things, then by all means do that! I do however recommend that you do at least some technical practice as a warmup, just to protect yourself from injuries. Personally, at this point in time, even if I might be considered a fast player by some, I feel that my speed is still one of the limiting factors in my playing. A reason for this is that as a teacher I need to be in control of many different playing styles, and that requires a higher level of technical comfort. Another reason is that I sometimes enjoy using speed creatively in my improvised soloing, and it’s much harder to improvise at high speeds than to just play pre-composed lines, so I need to be at a very high level to do that comfortably. I also enjoy mixing various structures: scales, arpeggios, pentatonics, intervallic patterns and so on, and each of those place different demands on my technique. You see, I analyzed my playing and decided that at this point in time I still need to work on my speed. Your goals are different from mine, so you should analyze your own playing and decide if you need to improve in this area. Check out this very interesting practice tool. I have found it to be very useful, and it has a ton of customizable features, so you can fine tune it to your needs. I will be doing a review of this at some point. If you do, then keep in mind that, at higher levels, technical improvements require tenacity and discipline. Of course that doesn’t mean “you need to practice 10000 hours with a metronome” as some would lead you to believe. This kind of advice does not generate willpower and discipline. What it does generate is disappointment. 1. Get the right information. 3. Get helpful instruction on how to use them. If I just tell you “practice 12 hours a day”, then you don’t stand a chance. On the other hand, If I show a way to practice that brings some tangible results in a short time, in every single practice session, it’s much easier for you to get excited and actually do it and get the results you want. Over the years, I have gathered a lot of effective material, and developed some of my own as well. I am in the process of putting all that information in the form of online lessons on the website. 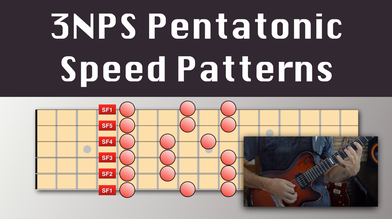 Right now, if you haven’t already, you can check out my very cool technique crash course “3NPS Pentatonic Speed Patterns"
It’s a three part mini course into which I squeezed a lot of useful tips that immediately make a difference in your playing. We apply these on the very challenging 3NPS Pentatonic fingerings, which makes this more like a heavy-weight gym for your fingers. I always try to immediately apply in a musical way everything I teach, so there is a lot of practical application in the course as well. WARNING! If you are a beginner you should take it easy with this, and warm up extremely well before attempting any of it. If the exercises seem too hard, you may even postpone it for when you get stronger. The course is free for all EMP mailing list members, so you will just need to use your member password to access the lessons. If you are not an EMP-Member, you can sign up for free using the form on this page and you will receive a password immediately. 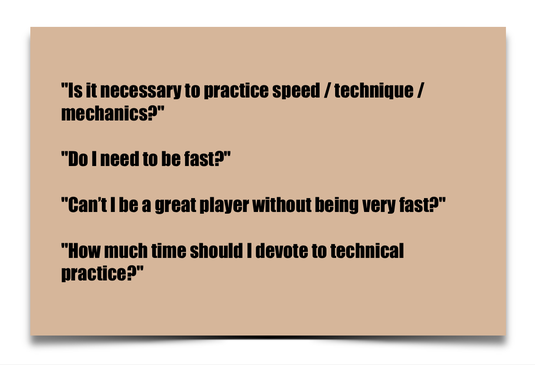 I will be sharing more on the subject of speed and technical development in future posts. I’m interested to know what your thoughts are on this, so feel free to comment and ask questions below.